This is a "dual beam" scanning electron microscope (SEM) that is also equipped with a focused ion beam (FIB). This SEM functions permit microscopic observations of a specimen while the FIB functions allows cutting of your sample. This FEG-SEM-FIB has an Omniprobe for TEM sample preparation. An SDD EDS analyzes specimen elemental chemistry. 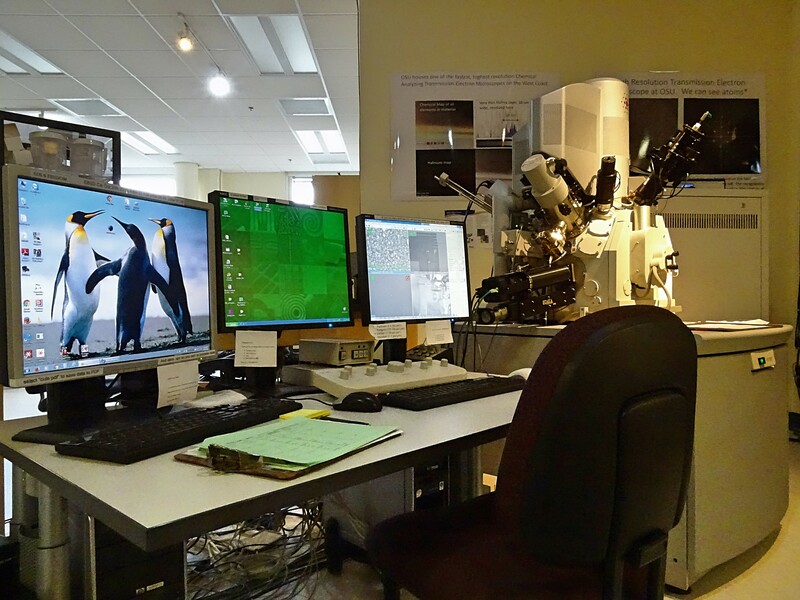 In addition an electron backscattered diffraction system (EBSD) collects the crystallography information from the specimen. Using these capabilities together makes it possible to learn about, or modify, a specimen's three dimensional (3D) structure and chemistry. It also has a plug in STEM detector as well as reduced pressure operation with water vapor bleed in. Magnification range from 30x to 1,280kx. Although, it lacks a through the lens detector and so practical magnification is limited to around 100,000x. Variable pressure vacuum system with high vacuum, low vacuum obtainable only after inserting a special plug in the pole piece.